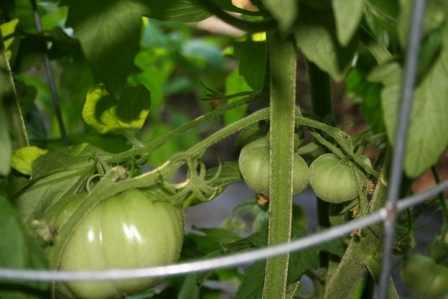 A blog about a small, backyard vegetable garden. What To Do With Blooming Tomatoes? The tomatoes are just about 6 weeks in the garden and they are… large. 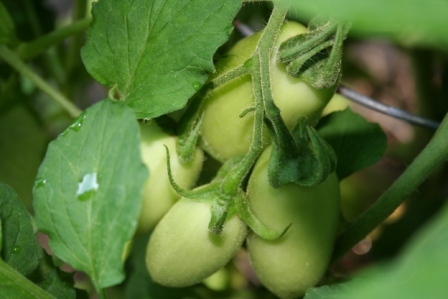 Generally speaking, an indeterminate tomato doubles in size each week early in its cycle, then they pretty much keep growing until you or the frost tells them to stop. This is certainly the fastest I’ve seen my tomato plants become gargantuan. Early on in their lives (in some cases before transplanting) they began blossoming. I did what most gardeners do at that point – begrudgingly plucked the flowers. I wanted the plants to become established, secure their roots, throw out some leaves to catch some rays. The inner workings of vegetable plants change once flowers emerge. Reproduction becomes more of the singular focus (my own flowers emerged at about age 13!) and that means the plant system begins giving itself over to the fruit. The romas, a much earlier determinate variety, on the front side of the garden are fruiting like crazy. No worries there. The little cage I used for this plant is probably insufficient, but I’ll just stake up stray vines. This plant’s brother is in a slightly different spot and is much more insufficiently caged. It’s producing, but I’m not banking on its long-term survival. For the indeterminates.. yikes. Big freaking plants. German Johnson is like a very tall guy right now. A few blossoms and one plum sized fruit that is growing each day. Of the five Brandywines I’ve got, they all look very healthy with just a few blossoms each. One of them is already sporting several tomatoes ranging from acorn sized to.. bigger acorn sized, to maybe a raquetball. Purple Cherokee has a dusting of blossoms and several frutis. I’ve got two Mother Russia and one is healthier than the other and has a few fruits going. The Trophy plants (2) and the Early Girl (1) and the Caspian Pink (1) are doing okay, but no fruit. 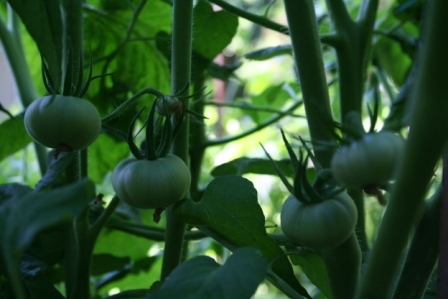 The cherry tomato plant is a freaking monster – it’s got clusters of fruit all over it. At this point – because I am in the midst of the newly-typical Connecticut summer (hot and very humid, humid at night, fog/mist in the morning) and the extra whammy of limited sun, I am worried about fungal/bacterial diseases. Wet plants that stay wet breed ick. For most of these plants, I’ll pull off a few of the leaves and stems at the bottom of the plants. I’ll wait to make the determination, but certainly the lowest leaves that I haven’t already pruned can go. This will improve air circulation. Ick usually starts at the bottom of the plant and I’d prefer to not give it anything to latch onto yet. Shala… never fear. THere is plenty of time for all of my tomatoes to rot, get eaten by creatures other than my family or stay green. You are to be congratulated. This Blog is Awesome! Seem like we share a lot in common when it comes to the Garden. This year I have recorded our Tomato Venture for the past 13 weeks. You and you readers may enjoy visiting the Videos and commenting. Appreciate Ratings also. We also started a blog. It’s so interesting to me how different our gardens are growing when we’re so geographically close. Did you grow from seed or plant nursery starts? What day did you get them in the ground? Mine went in containers on 5/18 this year. 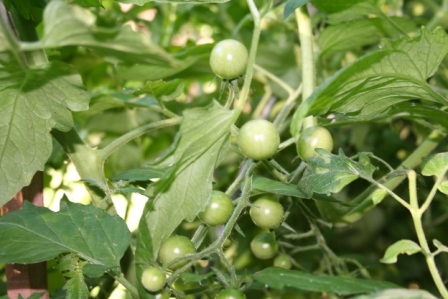 I just picked our first ripe cherry tomatoes today and though I have good sized fruit on all of my tomato plants (Bonnie Original, Park’s Whopper, Celebrity, Early Girl, and 2 Brandywine Pink), no signs of ripening yet. About half of my tomatoes are from seed. The others I got as starts either online or through two local gardening centers. My seed starts have been going for a long time now and even the online orders got to me early. They were all in the ground by the end of May and I’d been hardening them off for a couple of weeks before that. This is early though! I’m on vacation now (this post was written, but not posted before I left for vacation) so we’ll see what I have ripe. My guess is that I’ll have at least a few that are very close. Thanks amy! I’m off on vacation now.. wondering how beautiful these are now as i took the pictures about a week ago. Best of luck Lucien! Glad the pictures helped.